Liczba stron: 20 Jest to ujednolicona liczba stron, która ułatwi Ci porównanie długości książek. Każda strona Legimi to 200 słów. 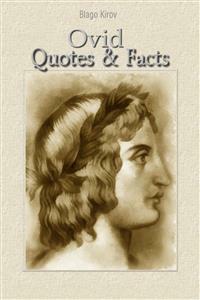 Publius Ovidius Naso (20 March 43 BC – AD 17/18), known as Ovid, was a Roman poet who lived during the reign of Augustus. He was a contemporary of the older Virgil and Horace with whom he is often ranked as one of the three canonical poets of Latin literature. The Imperial scholar Quintilian considered him the last of the Latin love elegists. He enjoyed enormous popularity, but, in one of the mysteries of literary history, he was sent by Augustus into exile in a remote province on the Black Sea, where he remained until his death. Ovid talks more about his own life than most other Roman poets. Ovid was born in Sulmo (modern Sulmona), in an Apennine valley east of Rome, to an important equestrian family. He was educated in rhetoric in Rome under the teachers Arellius Fuscus and Porcius Latro with his brother who excelled at oratory. His father wanted him to study rhetoric toward the practice of law.